Cover the bottom of a pot with oil and add the garlic and onion. Let cook for a few minutes. When the onion is ready, incorporate the meat and season, to taste. Add the cauliflower. Cover and let cook for 10 minutes. 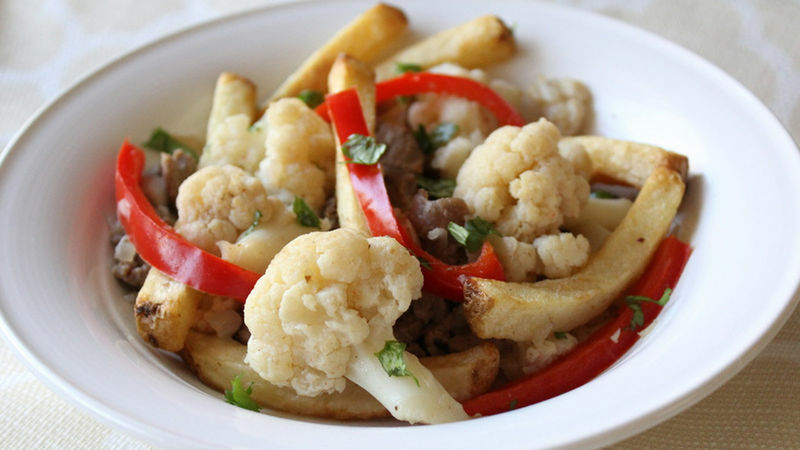 Add the red pepper and serve the “tossed cauliflower.” Sprinkle each portion with chopped cilantro to add extra color. Cauliflower is a very popular dish, but despite its popularity, there are many different options in terms of its flavor. I love cauliflower; I grew up eating it as a regular part of my diet. Just as there are a variety of flavors, there are also many different ways to prepare this veggie. I've tried it in salads, soups, roasted, fried and, my favorite, as tossed cauliflower. This “tossed cauliflower” recipe is as deliciosa as it is easy to make. If you want to eat something nourishing without sacrificing flavor, try this dish.